TO celebrate 70 years of sports car heritage and honour the legendary 1948 XK 120, Jaguar has developed two F-TYPE convertible rally cars, with design cues from the F-TYPE Chequered Flag Limited Edition. The one-off F-TYPE rally cars also pay homage to the legendary Jaguar XK 120 registered ‘NUB 120’ which, in the early 1950s in the hands of Ian Appleyard, completed three consecutive Alpine Rallies without incurring a single penalty point, winning the RAC and Tulip. 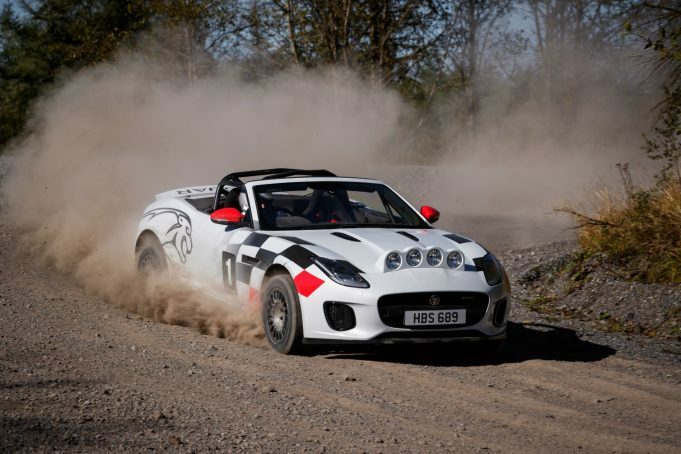 Both rally-specification F-TYPE convertibles are powered by Jaguar’s 221kW 2.0-litre Ingenium four-cylinder petrol engine, and are built to FIA specification, with comprehensively up-rated brakes and suspension, a protective roll cage, race-seats with six-point harness, bonnet-mounted light pod and fire extinguisher. Hand-built competition dampers and softer springs ensure the high performance cars can be driven flat-out over rough rally stages. With motor sport-spec wheels and tyres specifically for use on gravel, a limited-slip differential improves power delivery on loose surfaces while a hydraulic handbrake helps drivers tackle hairpin bends. The rally cars’ livery takes design inspiration from the new F-TYPE Chequered Flag Limited Edition, which features a range of subtle exterior visual enhancements, including unique 20-inch Gloss Black wheels with a Diamond Turned finish and a Black Contrast roof on the Coupé. Inside, the luxurious Ebony Windsor leather interior features performance seats with embossed chequered flag headrests and a dark brushed aluminium centre console trim finish. The Jaguar F-TYPE Chequered Flag Limited Edition is available from $139 650 plus on-roads (2.0 Coupe).